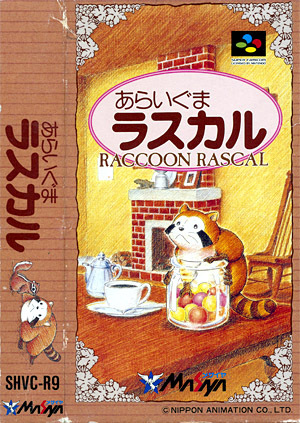 Araiguma Rascal (aka Raccoon Rascal) is a cute puzzle game published by Masaya, and based on a Japanese anime series originaly aired in 1977. 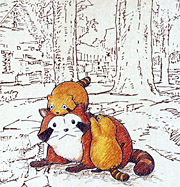 The player takes control of Rascal, a brown and cute raccoon, and must rearrange jars filled with all kind of items (apples, candies, melons, jam) that two squirrels constantly push away from their tree house. The raccoon can carry jars around, throw them in the air, jump, drop them right beneath him and even push them. 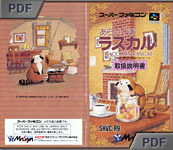 If he matches three or more jars of the same kind, then they disappear and increase a green bar located at the bottom of the screen - once the bar is full, Rascal completes the stage and jumps to the next one (although players are free to pick a stage at the beginning of the game). 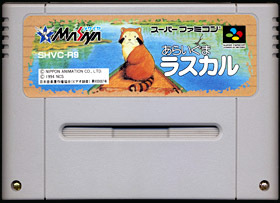 In addition to the one-player mode, Araiguma Rascal offers three two-player options that feature the young boy Sterling North (see the info section bellow). In the first one, two players must race as fast as possible along a course while avoiding or moving obstacles and jars strategically placed in the way. 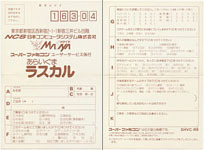 Then the two other modes are more traditional and feature a cooperative and versus gameplay based around the one-player puzzle formula.